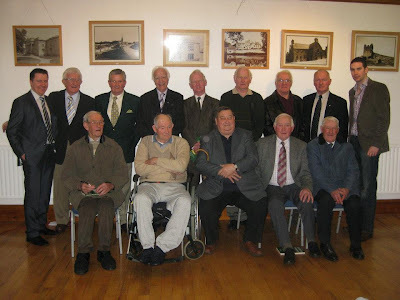 On Saturday 3rd December last two Edenderry men, Padraig Foy & Ciarán Reilly successfully launched their book recalling the great Offaly teams of 1960/61 in Tullamore. 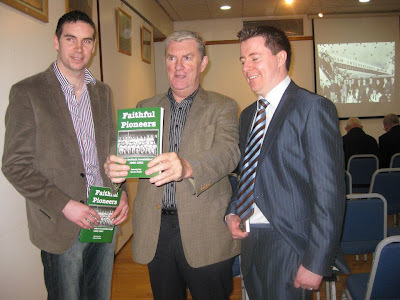 The great Eugene McGee was on hand to officially launch the book on behalf of Ciarán & Padraig. Eugene a legend in GAA circles spoke in glowing terms of the piece of work the lads had produced and ranked it at the very top of recent GAA historical records. Indeed Eugene gave a wonderful speech and had his audience enthralled as he recounted his memories of the teams, the characters and the era of the early 1960's. Many of the 1960's greats were there and were very pleased with the book and the reception they received on Saturday. It was great to see the great Sean Foran present and on his feet signing copies of the book. Other Edenderry greats Tommy Cullen & Mick Brady were unable to make it and we wish both of them well, particularly Tommy how is unwell at present. Both the Foy & Reilly families were present in large numbers and they must have been very proud of the two lads. 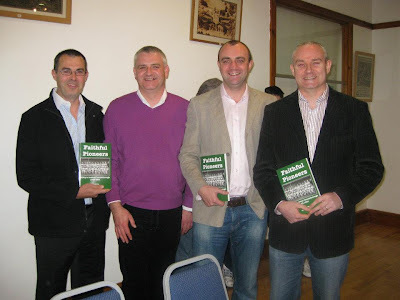 The book is a must for any Offaly GAA fan and is full of little gems of Offaly GAA history. It can be purchased locally at Foys - Next Door Off License, Brady Spar & Sweeneys Petrol Station and would make a great stocking filler from Christmas at €11.99. Alternatively email offaly1960@gmail.com for more details. Finally hearty congratulations from all at the club to Padraig & Ciarán on this fantastic achievement. At least we know who to apporach to write the "Tale of the Reds - Part II"